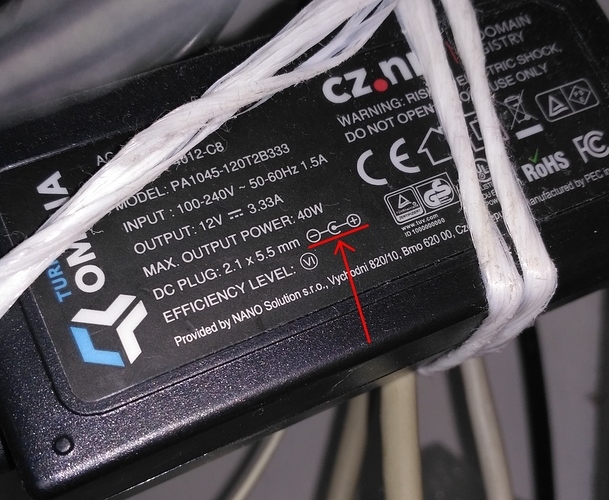 The power supply that came with my Turris Omnia has gone missing. I would like to get another one locally (I am in Singapore) and have been searching for the specs. Appreciate any pointers. I guess it is safe to use even a slightly less powerful supply, unless you power lots of peripherals. The original supply is a bit over-provisioned. Could Omnia serve 2.5HDD + 2-3 USB DVB T/T2 sticks? I am not sure, if thats related only to main power supply, or if hypothetically USB doesnt limit it somehow (and therefore powered USB hub would be wise). Adding the picture here for completeness.